This morning Julia and I are packing up the van to head out to Leonard’s Mills Living History Days. 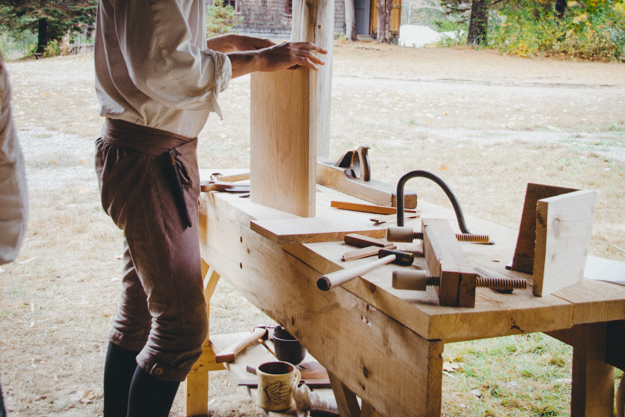 For years now, we’ve demonstrated 1790s Maine frontier life at this annual event. We usually stay in the small settler’s log cabin. That’s where Julia teaches visitors about cooking and general 18th century domestic life (which will be interesting with our newest addition this year). I always bring my portable workbench and tool chest to demonstrate period cabinetmaking. Last year I worked on Asher’s cradle/co-sleeper. This year I am going to be working on a commissioned rope bed similar to the one I built for Julia’s birthday a few years ago. There will also be a new feature this year: we will be demonstrating a late 18th century wedding in which I will be officiating as minister. I am not really ordained and this is not an actual wedding but it should be a lot of fun because the script is pieced together from various 18th century wedding services. There will be music and period dancing lessons afterward. It will be both days at 3pm, I believe. The Living History event is all day Saturday and Sunday. Check out the Facebook event page with directions, etc here: https://www.facebook.com/events/983793901654253/ It looks like the forecast is shaping up to be totally rain free, which is always a blessing at this event. I always love it when I get to meet readers of The Diary so I genuinely hope to see you there. I think it is a great effort you put into this. Seeing how people do things before makes us appreciate what we have now a lot more! And the Winner is… David Taylor!